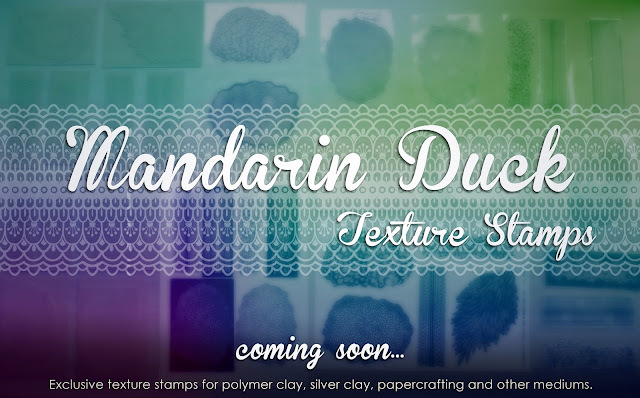 I am so excited to finally announce that I will be releasing a collection of Mandarin Duck Texture Stamps (c) very soon this summer! I am so worried if you will or will not like them, as I worked for 1.5 years to create these! I will start with releasing a couple of designs to be available for purchase, and as time passes, collection will keep growing. The most amazing part is that the journey from the beginning to the completion of the project took me about 1.5 years. Of course I didn't work on them every day, but I did think about them every day! As you can see from the picture on the right, this is my very first day and the beginning of a very first sketch. Quite a memorable photo as it's almost 1.5 years old. 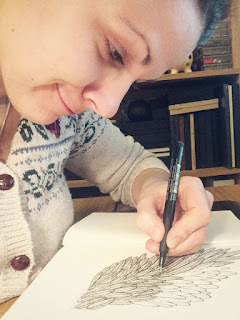 When planning and thinking about my textures, I wanted them to be an extension of me. Something that really speaks in my language, something that reflects who I am and what I do in polymer clay world. There are so many different stamps and texture stamps available and they all are so lovely. I had a lot of doubts if there is any chance for my textures to succeed in such a busy market. But then I realised that there is no need for me to impress anyone apart from my own self. So when creating these hand drawn designs and then editing these into a professional texture stamp quality artworks, I was thinking about how I am going to use these. When testing every sample I received from different manufacturers, I was so picky to my own self, that even Ashley said that I am being too harsh with myself! I replied, that if I will like them, then others will like them too. How can I release something I am not happy with? So in no way and not at any stage of my project I rushed it to make it just a money-maker. Of course, there is that too, otherwise I would just give them out for free, lol :) But money making was never my first priority. I tried to do my very best to provide the best affordable quality that is available on the market and which I could financially support on my own. So as you can see these are not just some sort of stock image purchased pictures that I turned into stamp designs. These are my own artworks, drawn by my own hands and they came from my own imagination. It was quite a struggle to find a good material and a great manufacturing technology, as some are amazing but super expensive, some were much cheaper but not good enough, not deep enough, not hard-but-flexible enough, weird looking, badly cut or coloured. All sorts really. I stopped on these transparent type texture stamps, as they have an amazing qualities in the way how they are made, how long they can last, how you need to care for them, how they are presented, and how functional and easy to work with they actually are. The fact that you can see an outline of the design on top of your stamp at all times, makes the stamping process so much easier. 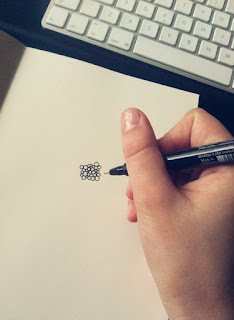 How many times I wanted to stamp just a little pattern from the stamp on a journal or a jewellery piece, but when I turned it upside down, I was only left with guessing if I will or will not imprint the correct part of the stamp. 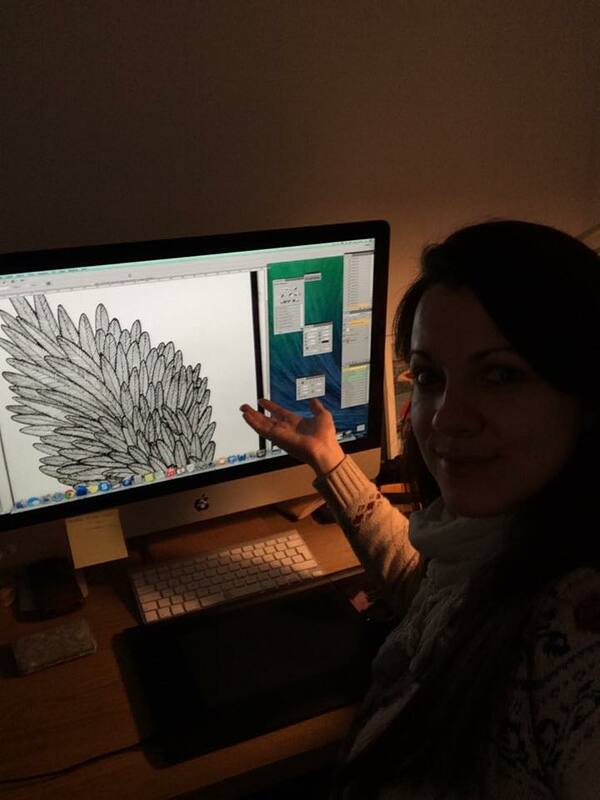 So transparency was so important for my designs. With the transparent stamp and the design outline on top of it you will never be confused with what you are doing! Also I was very particular about the edges of these stamps. First of all I didn't want the stamp to just end with a sharp rectangular outline. Whenever I am stamping some smaller textures, it's always a problem to join the edges together if I need to create a larger patterned space. 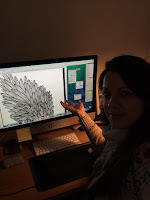 With these uneven outlined edges you can have an endless variation of connections, joining the edges or purposely using the edge parts to make one part of your design plain and the other one with texture. The physical quality of the material allows the texture stamps to be hard enough to create deep, sharp-edged texture imprints without smudging and smearing the pattern. Flexability of these texture stamps allow comfortable texturising procedure. Of course as any stamp, these will require some special way of work to ensure a maximum potential. Nothing special, just something I figured out in the process and am willing to share with you soon. I will reveal more photos, info and teasers soon!